Halloween has never been a part of my celebration culture. But I know that it's pretty popular in Singapore. All the fun horror greeting my eyes at the weekend stores tickled me, till I saw these women parading and looking gorgeously scary. 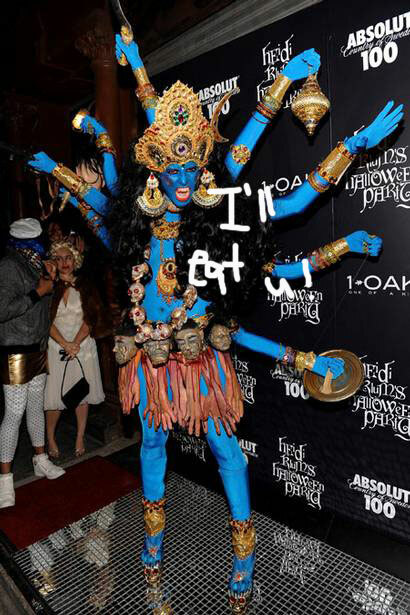 Their annual Halloween costume flashed just one picture in my head....Heidi Klum, in her 2008 Indian goddess costume! Since then, no Halloween attire has been able to beat this one. Now, a lot of people are not familiar with the blue Indian goddess that was Halloween-ed on Heidi. It wasn't Medusa, but the goddess Kali, the most powerful of all Hindu Gods, who reigns over and destroys evil that's represented by the heads of men strung around her the model’s stunning hip! What a deadly belt the beheaded men make! Heidi took the term drop dead gorgeous to a whole new level! At first glance, I too, like everyone back home saw the religious taboo being worn by Heidi of the goddess who is worshiped as the protector of the good and destroyer of evil. But Klum looked so convincing in her Kali avatar, that every time I went back to Google pics, the images almost got me on my knees. Maybe it was the aura of two strong women empowering each other. I'm not sure if she meant banter of goddess Kali (that would be "Heidi-eous"). Maybe she just came across a Puja experience that happens around the same time....and subsequently grabbed the Halloween chance to feel and show the goddess' power. And yes, I saw raw unadulterated POWER written all over her face and that blue heavy outfit she was wearing. Hopefully, she did not don this to get into the Most Powerful Women list for that year. I'm sure Ma Kali herself must have been amused by the avatar. * All pics taken from Perezhilton.